Well, it’s been a while hasn’t it? I’ve been crazy busy with work and schooling and life. I’m trying to get a little better organized so I can carve out some writing time because I have things to write! Like a reflection paper on an Old Testament topic for that course I’m taking. It might be due Monday. I might not have actually started it. There is a chance I won’t sit down to write it until Sunday night. But I digress. 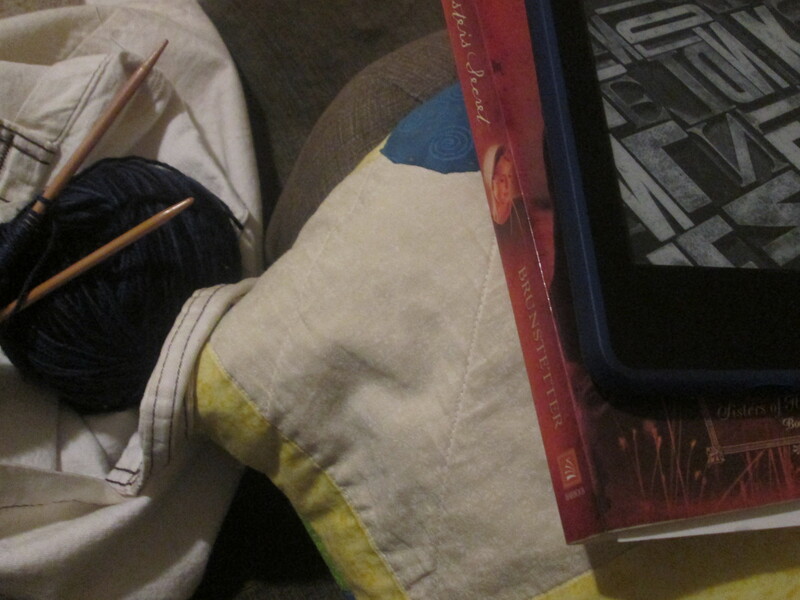 I am still knitting away on my secret commission. Halfway done! And still enjoying it! Hardly even dreaming of other projects. 😉 I am also working on a braided rug for my living room but that’s more of an if-I’m-upstairs-waiting-for-a-kid-I-might-as-well-work-on-something kind of project at the moment. Reading has been a little slower than usual. But that might be because I have too many books going at once. Currently (although not in my picture) I am reading Becoming Bea by Leslie Gould and The Great Themes of Scripture: Old Testament by Richard Rohr. And tons of Advent resources to put together suggestions and resources for work. Because did you know that Advent starts next week? I really need to get better at being ahead of these things! This entry was posted in books, knitting, Yarn Along. Bookmark the permalink. I am thrilled that you are half way through your secret project! Can’t wait to see it. I am plugging away on some gifts that have to be done by thanksgiving. I WILL make it and then I will cast on something for me hopefully. Christmas is fast approaching isn’t it. A wonderful time for secret plans and clever tricks. I am intrigued about your course and the old testament project.